Fish is seemingly promoted as the new penicillin. We uncover the science to show that it is plant oils and a plant based diet, not fish oils, that are the real way forward for lifelong health. 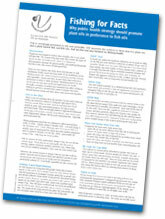 This fact sheet is available online only. People are encouraged to believe that a healthy diet is one which includes fish. The reason being that some fish contain the types of ‘good’ fat that our bodies need. There is a widespread misconception amongst the general public and health professionals that fish is the only source of these good fats. There are two reasons why these ideas have become so well established. Firstly, much has been made of the healthiness of the Mediterranean diet, which is based on generous servings of fruits and vegetables, cereals and olive oil and where fish is served in preference to meat or dairy products. Mealtimes tend to be very social and this may have profound implications for health. Secondly, a number of studies have examined the effect of fish in helping to prevent a second heart attack in people who have already had one attack and these show some protection benefits. There’s a lot of confusion about fat and diet, but the truth is that our bodies can’t function without it. Eating the right kind of fat is, however crucial. What we don’t need are saturated fats, found mainly in meat, dairy and animal products, but also in many processed foods. These are strongly linked to high blood cholesterol, hardening of the arteries, coronary heart disease, some cancers and other degenerative diseases. We do need unsaturated fats – especially polyunsaturated fats. Within polyunsaturated fats are substances called essential fatty acids, or EFAs – namely omega-6 (linoleic acid - LA) and omega-3 fats (linolenic acid – LNA). Although olive oil is not an EFA it is another type of unsaturated fat which has some healthy properties and it is good to include it in the diet. EFAs – particularly the omega-3 fats – help keep the heart healthy. Fish is a source of EFAs, particularly omega-3 fats, but not all fish contain them. Those that do are principally oily fish such as herring, salmon, mackerel, sardines and fresh tuna. White fish, such as cod, haddock and plaice, don’t and nor does tinned tuna. However, the richest sources of omega-3 fats are not fish at all but plants. Seed oils such as linseed (flax) and rapeseed (canola) as well as soya oil are rich sources as are seeds and nuts themselves particularly walnuts (1). Green leafy vegetables are also a source (2). It’s been known for a long time that people whose diet is based largely on fish and is rich in omega-3 have low rates of heart disease. This led researchers to investigate whether giving fish to people who had already suffered a heart attack would prevent them from having another attack. These are ‘secondary prevention trials’ and two of the largest are the DART and GISSI trials, which both used fish-based omega-3 fats. They did show a reduced risk, but much less publicised was the LYON trial, which used plant oils as a source of omega-3 fats. The results of this study showed that plant oils reduced the risk of a secondary heart attack by at least twice that of fish oils! It found that males who had been advised to eat as much as 400g of oily fish per week showed a reduction of almost 30 per cent in mortality (death) over two years. Although there were fewer fatal heart attacks, the total number of heart attacks wasn’t reduced. It is thought that fish oils help to normalise heartbeat rhythms and prevent blood from becoming too sticky and ‘clumping’ (3). Despite this apparent reduction in risk, a follow-up study 10 years later found there were no long-term survival benefits (4). This trial looked at people on a Mediterranean diet who had had a heart attack and survived it. Fish oil supplements equivalent to a whopping 100g of oily fish per day were given and showed a 20 per cent reduction in mortality (5). This was another secondary prevention trial, but instead of fish or fish oils, plant-derived omega-3 fatty acids were used. Amazingly, a 70 per cent reduction in mortality was achieved – more than double that of the fish trials! There was also a significant reduction in coronary ‘events’ and these protective effects were found to start quickly (6). Four years on, patients were still following the diet and their hearts were still being protected (7). Subsequent studies have confirmed the power of plant omega-3 fatty acids in protecting the heart (8,9). there are long-term survival benefits from consuming plant oils. The trials we’ve written about all looked at people who were at high risk of a heart attack. Because people are termed ‘low-risk’, it doesn’t mean they will never have an attack, it simply means they are further down the risk scale. They are those who eat low levels of saturated fat and therefore can include vegetarians and vegans (10,11). When researchers looked at low-risk groups they found that eating fish had no effect on reducing their chances of dying from a heart attack (12). Human beings have been so successful at spreading pollution that environmental contamination is widespread and all oceans now contain toxic chemicals. Persistent organic pollutants (POPs) are now part of most food chains and they become more concentrated the higher up the chain you go. Mercury, organophosphates, PCBs, dioxins, and radioactive pollution in some fish, are all highly toxic to life. Fatty foods have a tendency to ‘soak’ up toxins and so oily fish are particularly prone to absorbing them – the toxins are actually stored in the fatty part of the fish. By eating smaller fish, oily fish take on their toxic load and become ever more toxic themselves! POPs are implicated in heart disease, infertility and can harm developing foetuses. Responding to a Food Standards Agency 2002 survey, the Consumers’ Association warned that high levels of dioxins and PCBs in fish and fish oil supplements could “put millions at risk” (13). Other studies have found that over 60 per cent of bluefin tuna caught in the Mediterranean exceed EC ‘safety’ figures. Researchers have calculated that some of those people who eat high levels of these oily fish will far exceed the World Health Organisation’s (WHO) ‘safety’ levels (16, 17). A 2000 government study failed to detect any mercury in vegetarian diets and concluded, “it is reasonable to assume that because participants in this study did not eat fish, their dietary exposures to mercury will be substantially less than those of the general population” (18). One way mercury harms the body is by acting as a potent free radical. Free radicals are unstable molecules that damage body cells and the body’s main defence against them are antioxidants – beta-carotene (converted to vitamin A), and vitamins C and E. Plant foods are rich in these antioxidants and plant oils are particularly rich in vitamin E, which stops EFAs from deteriorating or going off. Only plant oils, not fish oils, contain protective vitamin E.
The FSA seem as muddled as everyone else about how much fish people should eat each week. Some of its publications say two servings and others say at least two servings. But, in any case, surveys show the vast majority of people are unaware of the official advice and most people are confused by what is meant by oily fish (13). The average UK consumption of oily fish is 53g per person per week (19). This meagre quantity represents only about a third of a single portion and is a tiny amount compared to the 400g weekly intake of oily fish which have been used to produce heart benefits in research studies. This shows that all the attempts to get the British public to eat fish is a spectacular failure. Seeds, nuts, beans and their oils are the richest-known sources of the ‘good’ fats. Green leafy vegetables also contain these essential fats. Walnuts, linseed (flaxseed) and rapeseed oil (canola) are all exceptionally rich in omega-3 fats. The best way to buy and store nuts, seeds and their oils is in very small quantities and to keep them in the fridge. This helps to ensure that they are as fresh as possible. These oils are not suitable for heating as it destroys the beneficial EFAs. Most healthfood shops and supermarkets sell packets of nuts and seeds and blended plant oils – usually marketed as oils rich in omega-3 and omega-6 fats. They contain information on how much oil to use each day. With whole seeds and nuts, a handful each day is normally sufficient. Olive oil can be used for cooking. Fish-like substitutes are available thanks to food technologists who have produced imitation fish fingers, scampi, tuna and salmon patZ that actually taste of fish. They are available in most healthfood shops. Adding fish to the diet will not bring about long-term good health. Plant-based vegetarian and vegan diets are the best choice for optimum health. Plant oils are a far healthier source of the essential fats we need. Plant oils halve the risk of heart disease compared with fish oils. Fish is a spectacularly unpopular food in the UK. Fish is likely to be contaminated with harmful chemicals. Plant oils are far less likely to turn rancid than fish oils. Plant oils as nuts and seeds are the ultimate fast food. Plant-based diets offer protection against many diseases. Our hearts don’t need fish, our brains don’t need fish and our health is far better served by plant oils and a well-balanced plant-based diet. 2. Pereira C et al, 2001. The Alpha-Linolenic Acid Content of Green VegetablesCommonly Available in Australia. Int. J. Vitam. Nutr. Res.;71(4):223-228. 3. Burr ML et al, 1989. Effects of Changes in Fat, Fish and Fibre Intakes onDeath and Myocardial Reinfarction: Diet And Reinfarction Trial (DART). TheLancet;8666:757-761. 4. Ness AR et al, 2002. The Long-Term Effect of Dietary Advice in Men withCoronary Disease: Follow-Up of the Diet and Reinfarction Trial (DART). Europ.J. Clin. Nutr.;56:512-518. 5. GISSI-Prevenzione Investigators, 1999. Dietary Supplementation with N-3 Polyunsaturated Fatty Acids and Vitamin E After Myocardial Infarction: Results of the GISSI-Prevenzione Trial. The Lancet;354:447-455. 7. De Lorgeril M et al, 1999. Mediterranean Diet, Traditional Risk Factors and the Rate of cardiovascular Complications After Myocardial Infarction. Circulation;99:779-785. 8. Singh RB et al, 1997. Randomised, Double-Blind, Placebo-Controlled Trial of Fish Oil and Mustard Oil in Patients with Suspected Acute Myocardial Infarction: The Indian Experiment of Infarct Survival-4. Cardiovas. Drugs and Therapy;11:485-491. 9. Singh RB et al, 2002. Effect of an Indo-Mediterranean Diet on Progression ofCoronary Artery Disease in High Risk Patients (Indo-Mediterranean Diet HeartStudy): A Randomised Single-Blind Trial. The Lancet;360:1455-1461. 10. Key TJ et al, 1999. Health Benefits of a Vegetarian Diet. Proc. Nutr Soc.;58:271-275. 11. ADA Reports. Position of the American Dietetic Association and Dietitians ofCanada: Vegetarian Diets. 2003. JADA;103(16):748-765. 12. Marckmann P & Gronbaek M, 1999. Fish Consumption and Coronary HeartDisease Mortality. A Systematic Review of Prospective Cohort Studies. Europ. J.Clin. Nutr.;53:585-590. 13. Consumers’ Association, ‘Fish – what’s the catch’, Which?, p.7-9, October 2002. 14. COT Statement (2002/04) in December 2002 concerning a FSA survey on thelevels of mercury in fish and shellfish. 15. FSA statement ref: 40/2003, Mercury in imported fish and shellfish, UKfarmed fish and their products, July 2003. 16. Storelli MM et al, 2002. Total and Methylmercury Residues in Tuna-Fishfrom the Mediterranean Sea. Food Add. And Contam.;19(8):715-720. 17. Storelli MM et al, 2003. Total Mercury and Methylmercury Content in Ediblefish from the Mediterranean Sea. J. of Food Protection;66(2):300-303. 18. MAFF, 2000, Duplicate Diet Study of Vegetarians. 19. Food Standards Agency, 2002, The National Diet and Nutrition Survey: adultsaged 19 to 64 years, HMSO.